of oxidation states ranging from the highly reduced sulfide (-2) to the fully oxidized sulfate (SOij-) (+6). Several intermediate oxidation states of sulfur can act as either electron donors or electron acceptors depending on environmental conditions, the most notable two being elemental sulfur (S0) and thiosulfate (S2O2-). Many diverse microbial processes contribute to the ecologically important steps in the biogeochemical cycling of sulfur (summarized in Table 2). In many ways the S cycle resembles the N cycle, but there are two important distinctions: (1) the sulfur cycle has no equivalent to nitrogen fixation that brings an element into the biosphere from the atmosphere and (2) photo-synthetic microorganisms use sulfide and elemental S as an electron source for reducing carbon dioxide during autotrophy. Similar to fully reduced forms of carbon (methane) and nitrogen (ammonia), the fully reduced form of sulfur (sulfide) is thermodynamically unstable in the presence of oxygen and other potential oxidants; thus, chemolithotrophic bacteria (e.g., Thiobacillus; Beggiatoa) use oxygen as a final electron acceptor - oxidizing the electron donor, sulfide, to sulfate. Reproduced from Madigan MM, Martinko J, and Parker J, Brocks Biology of Microorganism, 9th edn., © 2000. Electronically reproduced by permission of pearson Education, Inc., Upper Saddle River, New Jersey. 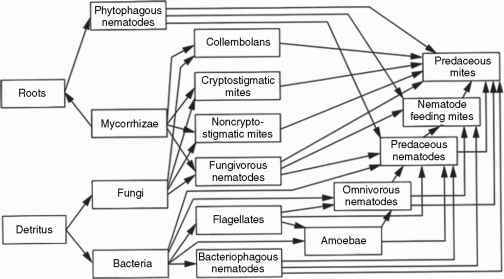 in most aquatic habitats, where these microorganisms function (much like methanogens) as terminators of the anaerobic food chain. Sulfate reduction is a crucial respiratory process in marine habitats that contain an abundance of sulfate and lack other thermodynamically more favorable electron acceptors. Once formed, sulfide has the potential to support a variety of chemolitho-trophic organisms capable of oxidizing reduced forms of inorganic sulfur to more oxidized sulfur species. The production of hydrogen sulfide from elemental sulfur has been shown to be catalyzed by a variety of bacteria, fungi, plants, and animal tissues as well as abiotic mechanisms. However, the reduction of elemental sulfur to sulfide in an energy-yielding process is performed exclusively by prokaryotic microorganisms found in both Bacteria and Archaea. This process, know as elemental sulfur reduction or sulfur respiration (Table 2), has been typically evidenced by sulfur-dependent growth on nonfermentable substrates such as hydrogen or formate. Most SRB cannot reduce elemental sulfur, and for many species, it has been found to be inhibitory. However, some members of the genera Desulfomicrobium and Desulfovibrio have been shown to grow with elemental sulfur as an electron acceptor while a larger group reduces elemental sulfur without growth. The reductase enzyme involved in this process has been identified as a tetraheme cytochrome c3 in several species; hydrogen serves as a source of electrons. Membrane preparations from active bacteria couple the sulfur-dependent hydrogen oxidation to ATP synthesis, and it appears that sulfur respiration in these organisms is due to the relaxed specificity of this c-type cytochrome resulting in an abbreviated electron transfer chain without the involvement of enzymes directly responsible for the reduction of sulfate to sulfide. Given the widespread distribution of sulfur-utilizing microorganisms and their diverse metabolic activities, it is not surprising that they play a key role in the recycling of sulfur and carbon.